The Film Chest will get your toes a’tappin and loosen up those vocal chords on July 19 with 17 music-themed films — on five discs — being released as The Golden Age of Musicals. The Duke is Tops (1938) is a black musical starring Duke Davis and Lena Horne from Million Dollar Productions (specialized in casting black talent during the pre-war period) as sweethearts who go their separate ways (doom and gloom), but it all ends on a happy note. Lena Horne is showcased in two numbers — “I Know You Remember” and “Don't Let Our Love Song Turn Into a Blues” — plus there are performances by a half-dozen black groups rarely seen by white audiences during this period. Second Chorus (1940) teams Fred Astaire with Paulette Goddard, with Astaire as a life-long College or the girl of his dreams … it’s a tough decision! Over a dozen song and dance numbers are included here. college student who is forced to give up the aimless lifestyle when he falls in love with Goddard … and she, horror of horrors, heads off to New York City! Private Buckaroo (1942), the Andrew Sisters and Harry James and His Orchestra shine with such delights as “Private Buckaroo,” “Don’t Sit Under the Apple Tree” and “Three Little Sisters,” plus Donald O’Connor and Peggy Ryan deliver dancing routines. And be on the lookout for Three Stooge alumni Shemp Howard and East Side Kid star Huntz Hall in this all-star musical comedy. Stage Door Canteen (1943), this all-star musical review from World War II has a loose plot about a soldier named Dakota (played by William Terry), who visits a “club” for service men — that is populated by celebrities (dozens of familiar faces do cameos) — and falls in love (Cheryl Walker). 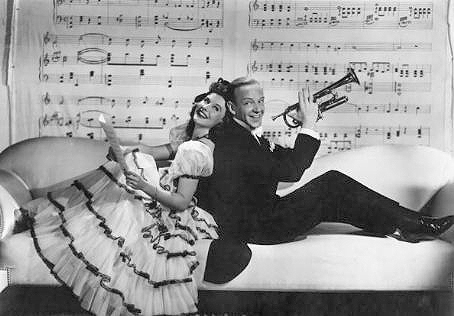 There are something like 18 musical numbers performed during Dakota’s visit … included are “A Rookie and His Rhythm” (performed by the Kay Kyser Band), “She's a Bombshell from Brooklyn” (performed by Lina Roman, with backing from The Xavier Cugat Orchestra) and Ethel Waters delivers “Quick Sands” (with backing by the Count Basie Orchestra). This is the Army (1943) is a filmed version of Irving Berlin’s extremely successful Broadway Play — Berlin provides something like 19 tunes for this all star musical comedy starring George Murphy, Rosemary DeCamp, Ronald Reagan and Joan Leslie. 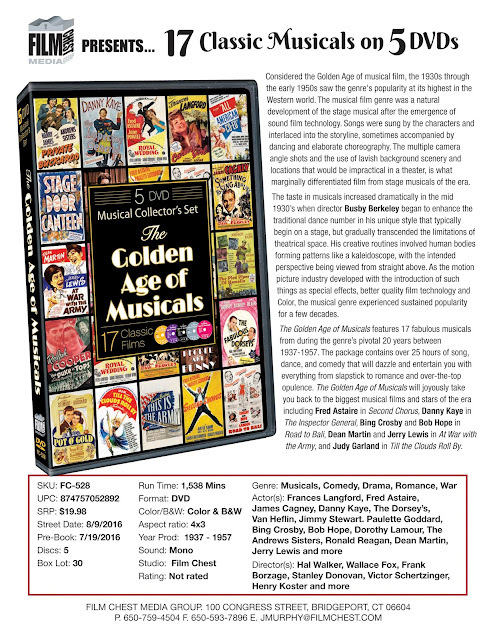 Included in the review are Kate Smith’s rendition of “God Bless America,” George Murphy singing and dancing with “We're on Our Way to France” and “My Sweetie,” Frances Langford chimes in with “What Does He Look Like” and even Irving Berlin gets in the act with “Oh, How I Hate to Get Up in the Morning” (he is joined by George Murphy, George Tobias and Charles Butterworth). 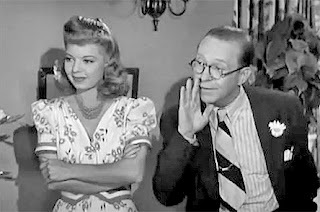 People are Funny (1946) features Jack Haley and Ozzie Nelson as radio rivals (the film’s title is based on the Art Linkletter radio show of the same name), Helen Walker is Nelson’s love interest and Rudy Vallee is the clueless sponsor that Haley and Nelson are after. 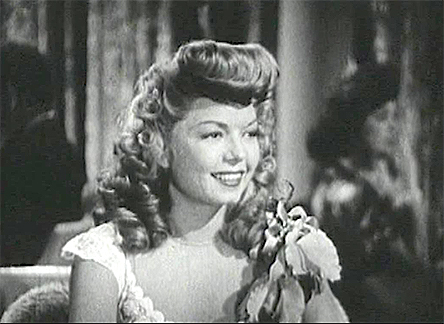 Blended in with the hyper comedy elements are “time outs” for musical numbers, including Frances Langford’s singing “I'm in the Mood for Love” and The Vagabonds teaming for a trio of numbers. 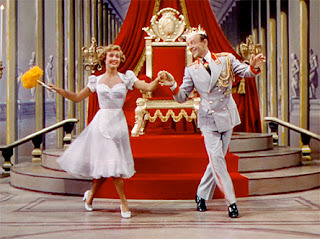 Till the Clouds Roll By (1946) is the big all-star musical of the Christmas-season of 1946 which was laced together as a biopic for the career of Jerome Kern, but was really a showcase for the talents of June Allyson (“Till the Clouds Roll By” and “Leave it to Jane” with Ray McDonald), Judy Garland (“Look for the Silver Lining,” “Who?” and “Sunny”), Dinah Shore (“The Last Time I Saw Paris”), Lena Horne (“Why was I Born?”), Frank Sinatra (“Ol' Man River”) and more. 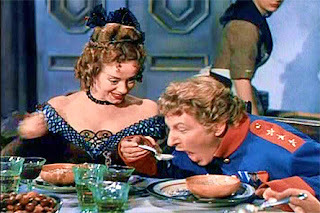 Inspector General (1949), Danny Kaye is a traveling performer in a “medicine show” who sings a half-dozen songs, romances Barbara Bates and is mistaken for the Inspector General by corrupt town officials in this Golden Globe-winner for Best Musical Score. Co-stars include Walter Slezak, Gene Lockhart, Alan Hale and Elsa Lanchester. Royal Wedding (1951), directed by Stanley Donen and starring Fred Astaire and Jane Powell … who could ask for more! Included in the dance routines is Astaire’s classic dancing on the walls and ceiling of his hotel room (done with a rotating gimbal) in “You’re All the World to Me” and “Open Your Eyes,” which features Astaire and Powell in a dance routine on board ship during heavy waves (it’s a hoot). The Pied Piper of Hamelin (1957) is a made-for-television musical special that aired during Thanksgiving on NBC. Van Johnson stars as the title character, Lori Nelson is the romantic lead and Claude Rains is the Mayor of Hamelin, with Doodles Weaver and Kay Starr joining in. There are a dozen musical numbers included in the festivities — “How Can I Tell You?,” “Feats of the Piper,” “Fool’s Gold” and “My Heart Will Fly To Heaven” are counted among these. Paramount Home Media announced its first — of many — post-Labor Day releases this past week and it is a doozy! 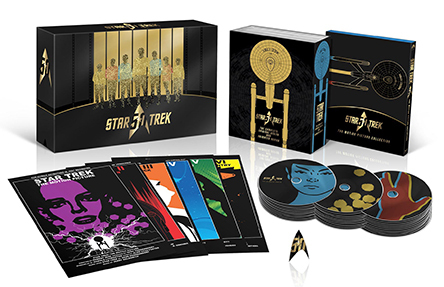 On Sept. 6 — the first street-date Tuesday after Labor Day — they are unleashing 30-disc mega set on Blu-ray titled Star Trek 50th Anniversary TV and Movie Collection. The packaging is almost too good … why would you want to break the seal (but you must)! Included are all three seasons of the original Star Trek television series — featuring William Shatner, the late Leonard Nimoy, DeForest Kelley, James Doohan, Nichelle Nichols, George Takei and second-season newcomer Walter Koenig — all six films featuring the original cast (from Star Trek: The Motion Picture in 1979 to Star Trek VI: The Undiscovered Country in 1991) and the short-lived animated series (1973/1974). All of the bonus features included in the individual releases are also to be found in this “KEEPER” collection. These include the likes of the documentary, Star Trek: The Journey to the Silver Screen, and such featurettes as “The New Frontier: Resurrecting Star Trek,” “Maiden Voyage: Making Star Trek: The Motion Picture,” “The Genesis Effect: Engineering The Wrath of Khan” and “End of an Era: Charting the Undiscovered Country” (to name just a few). 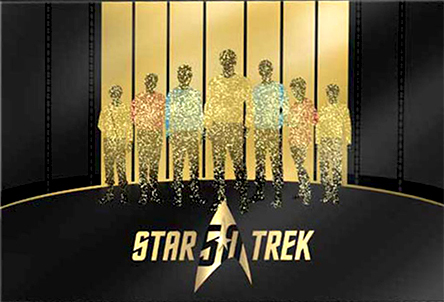 There’s also a collectible Starfleet pin a six-strong collection of mini-posters (one sheet replicas) for the six films in the series. 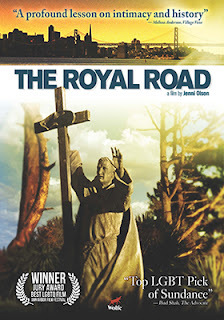 Filmmaker Jenni Olson’s deceptively engaging film, The Royal Road, which has been capturing both the attention of mainstream film critics and the affection of audiences worldwide through screenings as numerous festivals (along with the awards that go with such adoration), will be making its way to DVD on Sept. 6 courtesy of Wolfe. We say “deceptively,” in that Olson, who didn’t start out as a filmmaker, but who is a co-director of Frameline and a film historian, got the “bug” back in the 1990s by — according to interviews — “framing” shots of interesting and very random things. A series of short films followed. 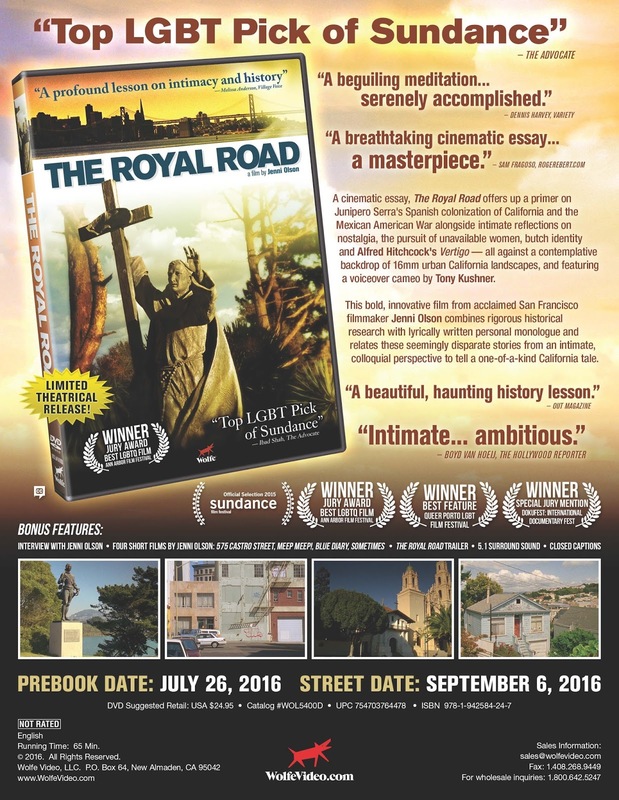 The Royal Road is a collection, so to speak, of her “random” look at California from an outsider’s point-of-view. 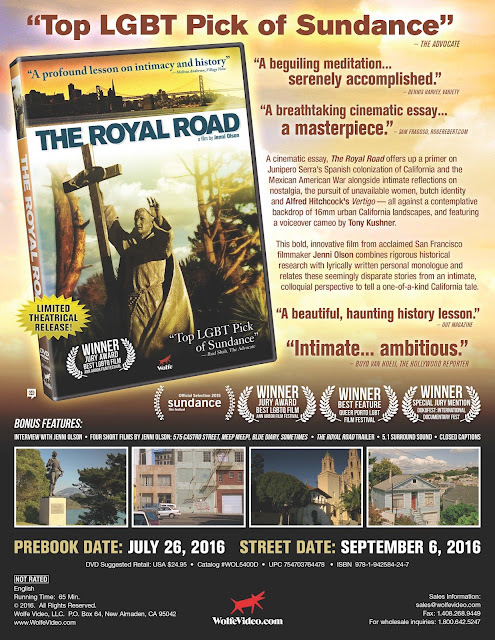 Eclectic impressions of the Golden State — very much in the spirit of James Burke’s Connections from the late ‘70s — that ranges from Father Junipero Serra’s chain of missions, Hitchcock’s 1958 film, Vertigo and her own frustrations with unrequited love. Bonus goodies included four of filmmaker Jenni Olson’s short films — 575 Castro Street, Meep Meep!, Blue Diary and Sometimes — plus a newly-prepared video session with Olson. 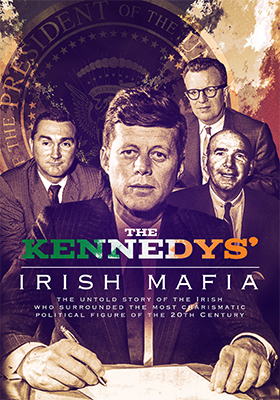 Documentary filmmaker David Harvey’s insightful look at the men who surrounded President John F. Kennedy, Kennedys’ Irish Mafia, will be available on DVD on July 12 from Network Ireland Television … MVD Entertainment Group will be directing the domestic sales and distribution effort. 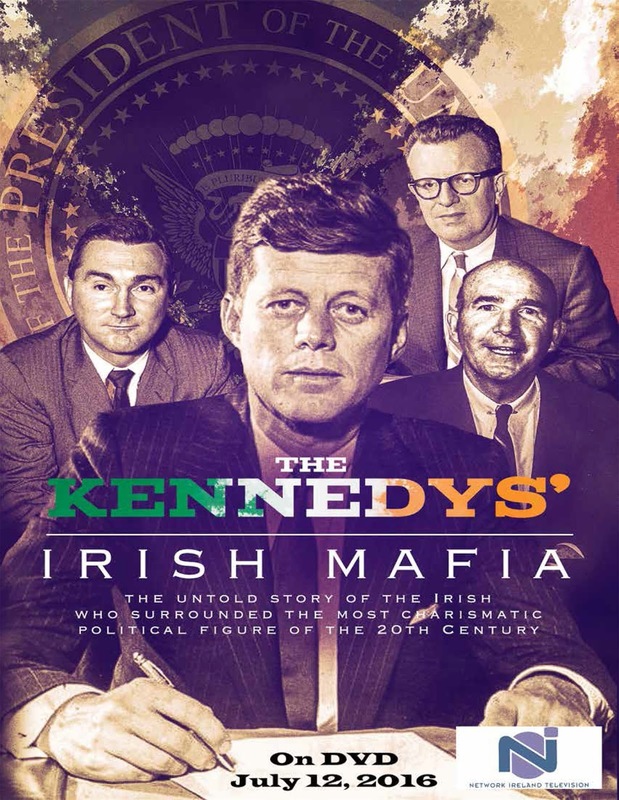 Key advisers to Kennedy, Dave Francis Powers (personal aide to the president), Lawrence O’Brien (future Commissioner of the NBA) and Kenny O’Donnell (White House Appointments Secretary) were known for their intense loyalty and were nicknamed “The Irish Mafia. Harvey delves into their special relationship with JFK. Of note, all three had accompanied the president to Dallas in November of 1963 and were in the motorcade following Kennedy when he was assassinated. 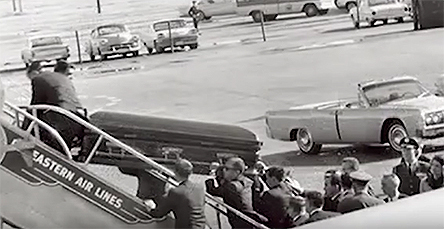 According to Harvey’s documentary, when it was decided to bring Kennedy’s body back to D.C. on Air Force One, Powers, O’Brien and O’Donnell not only moved the body from Parkland, but they can be seen physically carrying the president’s coffin up the gangway (there was no hoist available) in vintage film footage from that fateful day. Bonus features include over an hour’s worth of video sessions with with Patrick Kennedy, Sandy Vancour, Helen O’Donnell, Kathleen Kennedy and Lawrence O’Brien. While Disney fusses over whether to commit to the newly-launched 4K Ultra HD format, Shout! Factory is quick to follow-up on its June 7 entry — Journey to Space — with two new 4K Ultra HD/Blu-ray Combo Pack selections that are tabbed for release on July 12. The first of these is documentary filmmaker Mike Slee’s spectacular Flight of the Butterflies. 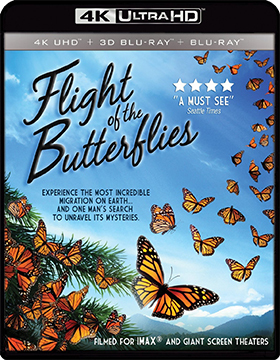 This 2012 IMAX presentation follows the Mexico to Canada migration trek of millions of Monarch butterflies in something of a storytelling mode — the footage captured is nothing short of breathtaking. Teamed with it is documentary filmmaker Stephen Low’s Rocky Mountain Express — a magical journey through the Canadian Rocky Mountains for a look back in time at the history of Canada’s transcontinental railroad. 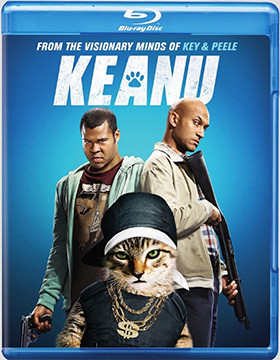 Warner Bros. Home Entertainment let it be known this past week that director Peter Atencio’s comedy starring Key and Peele, Keanu, will be making its way to the home entertainment market place on Aug. 2 as both DVD and Blu-ray product offerings. The ARR comes in at 95 days and ticket sales from its pre-Memorial Day theatrical run totaled $20.5 million. When Keanu is taken hostage, no not THAT Keanu, but Keanu the cat, Clarence (Keegan-Michael Key) and Rell (Jordan Peele) spring into action and assume the personas of street thugs to convince the “catnappers” that crime doesn’t pay. Of course things for the boys go south from there as they are mistaken for the ruthless killers know as the “Allentown Boys” (who do a bit of their handy work during the film’s opening sequence). A deal is worked out, help provide the muscle on a dangerous drug deal and Keanu will be returned. If you are a fan of Key and Peele, then all the plot you are going to need is a missing cat and some alternate identities — which the comic duo deliver in spades — to make for 99 minutes of pure fun. They even got that other Keanu to do the voice of his namesake in a comedy sketch that can easily stand on its own. 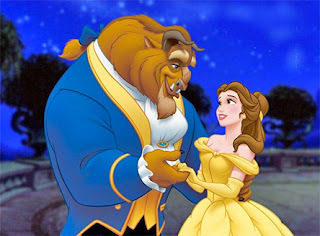 In other release news this week from Warner Bros. Home Entertainment, Aug. 16 marks the DVD debut of the fourth installment in the studio’s “Cinderella” film series. Titled A Cinderella Story: If the Shoe Fits, it follows A Cinderella Story (2004, with Hilary Duff), Another Cinderella Story (2008, with Selena Gomez) and Cinderella Story: Once Upon a Song (2011, with Lucy Hale), with Sofia Carson taking over the updated Cinderella persona. 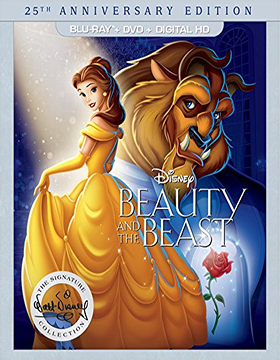 Walt Disney Studios Home Entertainment continues to sidestep support for the newly launched 4K Ultra HD format with news this week that the directing team of Gary Trousdale and Kirk Wise’s 1991 landmark animated hit, Beauty and the Beast, will be getting a 25th Anniversary Edition promotion on Sept. 20. 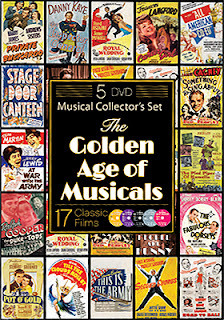 There will be a Blu-ray/DVD Combo disc featuring “four” different viewing options — the original theatrical release, a workprint version, which was screened at the New York Film Festival about five months before the film opened, an “extended” version (featuring the “Human Again” song sequence) and a “sing-a-along” version. The press release says squat about a new transfer — either 2K or 4K — so this appears to be the 2010 “Diamond Edition” dusted off for another bite at the apple. Disney missed the boat with Star Wars: Episode VII – The Force Awakens as a 4K Ultra HD release, but was understandable to a degree in that the film was moved quickly to market in April (just 109 days from its theatrical launch) and the format had only been launched one month earlier. They can always revisit a 4K Ultra HD version at some future point. But skipping this opportunity is a bit puzzling. As to bonus goodies, in addition to the four viewing options, there are five newly prepared featurettes — “Menken & Friends: 25 Years of Musical Inspiration,” “#1074: Walt, Fairy Tales & Beauty and the Beast,” “Always Belle,” “The Recording Sessions” and “25 Fun Facts About Beauty and the Beast” — plus there’s a sneak peek at director Bill Condon’s new live-action version (in theatres Mar. 17 of next year) starring Emma Watson as Belle and Dan Stevens (perhaps best knows as Matthew Crawley in the Downton Abbey television series) as The Beast. The next window for Walt Disney Studios Home Entertainment to enter the 4K Ultra HD market place would be with filmmakers Anthony and Joe Russo’s Captain America: Civil War sometime after Labor Day.